A few weeks back, I was pushing one of our kamado tables and all of a sudden it ground to a halt. I figured that it must have hit a stray piece of smoking wood or lump coal. Nope, one of the wheel casings just fell apart. This was a stock BGE short table that is about 5 years old. I suppose that's a reasonable life expectancy for rubber outdoors. After our last BBQ contest, I decided to go ahead and replace the wheels before putting a 200 pound grill back in it. Unless I could find the exact wheel, I couldn't replace just one wheel. Turns out it didn't matter - all four wheels were cracked. I decided to upgrade them while I was at it. 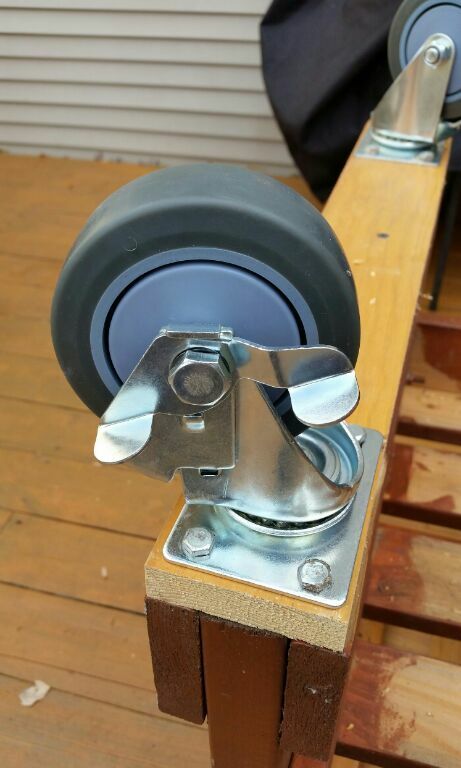 I was surprised with how many caster wheel options the big box hardware store had in stock. I went with 4' instead of the 3' stock wheels. 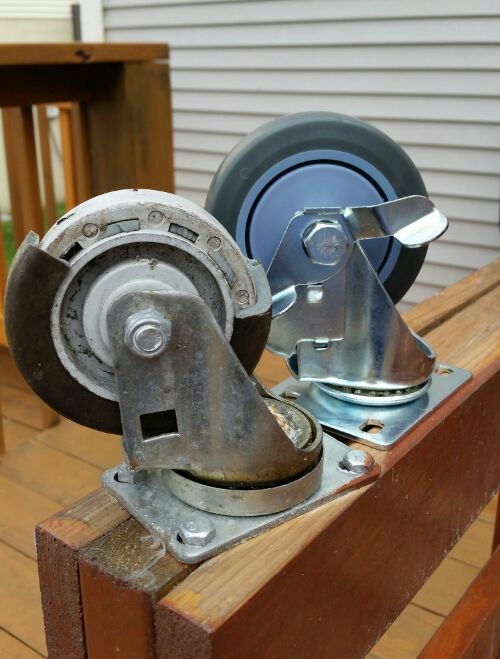 The new wheels were also locking casters and had double the weight load rating. They were about $9 each. 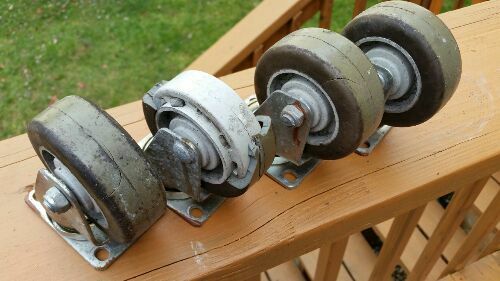 As you can see from the above picture, the base of the older wheels was smaller and they had them mounted cockeyed. I think that was just because the way the three boards line up. 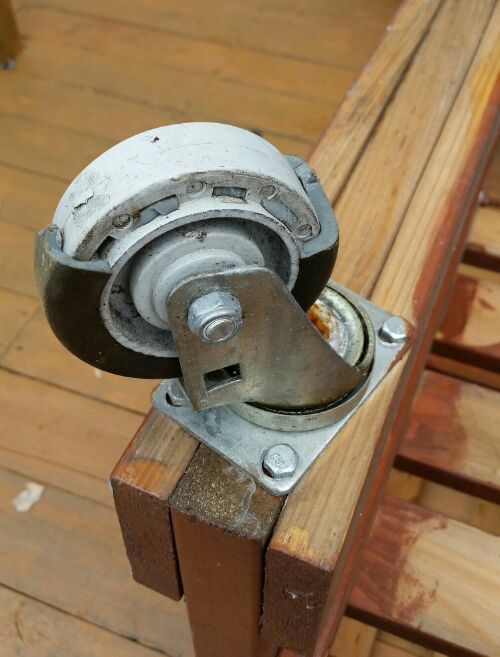 I wanted mine straight so I added a 1" x 3" strip with 2" deck screws and then mounted the wheels into that strip. I'll have to stain the new piece later but I'll be doing cosmetic work on both tables this Spring. 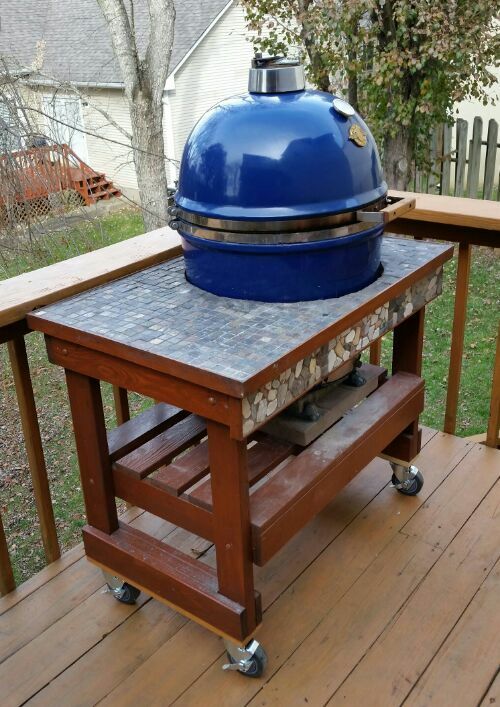 Once we got them all installed, we loaded the Grill Dome into the table. The larger wheels and the strip that I added raises the table about 1 1/2", which is actually better for me. In the Spring I am thinking about replacing the tile tops. My other table is going on 8 years old and it is showing the wear. I like the tile but even with a backer board, the different expansion rates cause a lot of cracks in tile and grout during the winter. I am thinking about either poured concrete tops (would rather avoid the weight) or stainless counter tops.